DP! : How are you guys looking forward to playing at this year’s Hit The Deck Festival? Tay: We’re definitely very excited to be a part of it this year. It’s always nice to reunite with other bands and friends in one place. DP! : There’s a lot of different band on the line-up this year, is there anyone that you’re particularly excited to see or plan on catching? Tay: For me personally, I want to catch The Wonder Years and The Swellers. DP! : You guys are on your first full headline tour of the UK whilst you’re over here for Hit The Deck, do you guys enjoy playing over in the UK? Tay: We love playing here. Personally, it is my favourite country to tour. DP! : You released your debut album ‘Best Intentions’ towards the end of last year, how’ve you been finding the reaction to it from your fans and also critics alike? Tay: The reaction has been really positive and I’ve been so grateful for all of the feedback and support. DP! : With so many different bands on the line-up, why should people come and check you guys out? Tay: We have fun and we want everyone else to have fun too. It’s always weird answering this question like it’s a competition. I encourage everyone to check our set out, and if it’s not for you then it’s not. No hard feelings. DP! : Will you guys be letting yourself loose at the after party? Tay: Perhaps. It always depends on how my voice is feeling on the day. It’s like I have to babysit my own voice, haha. DP! : Finally, is there anything else that you’d like to add and share with our readers? Tay: Thanks so much for taking the time to read this, and I hope that you all have a good time at Hit The Deck. 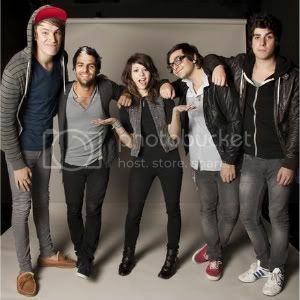 NEWS: We Are The In Crowd announce title for debut album! NEWS: All Time Low announce UK headline tour for 2012!